Online brokerage firm Zecco is one of the participants in Twitter’s Promoted Tweets program – currently in beta – and this morning announced that the ad platform has proven to be very effective for the company to date. The company says it sampled 50 Promoted Tweets over the past two months and measured their effectiveness, seeing a 50% increase in engagement on average as compared to regular messages posted on Zecco’s Twitter account. Some of the tweets, which are centered around financial market commentary and new product offerings, even saw a 200% to 300% increase in engagement, the company adds. Twitter launched Promoted Tweets last April, much to the chagrin of users initially. Basically, the system allows advertisers – only a handful of companies participate in the beta program today – to purchase keywords and select tweets that will appear on top of Twitter Search results for said terms. Zecco says it plans to use the Promoted Tweets platform to share investment-focused resources, as well as real-time intelligence from the ZeccoShare community, such as “most traded” alerts to make investors aware of new opportunities. Last April, Zecco announced Zap Trade, a plug-in trading experience for the web, enabling investors to place trades directly from top finance and investing websites. 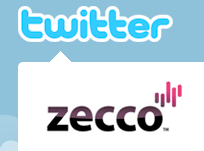 StockTwits, a Twitter-powered financial community, partnered with Zecco to embed the technology into the StockTwits website to allow investors to place trades with Zecco Trading and get real-time quotes directly through the website.